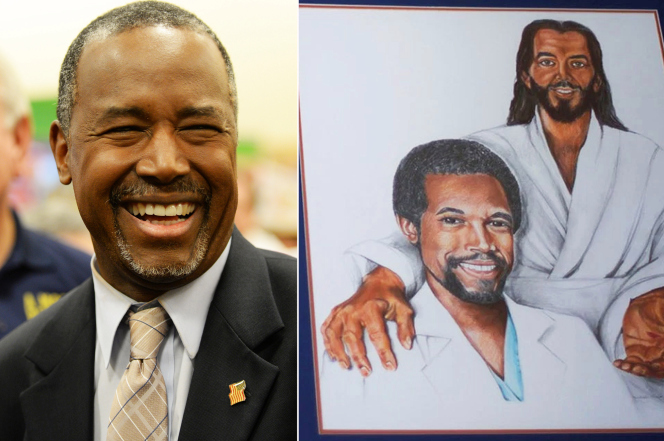 Anyone who thought Ben Carson wasn’t being truthful when he said the person he’d most like to share a drink with is Jesus clearly has not been inside the Republican presidential hopeful’s home. Photos taken inside the pediatric surgeon’s residence in Upperco, Md., in November 2014 reveal he possessed a rendering of himself seated next to a smiling Jesus Christ. Not much is known of the portrait, but it had resided in Carson’s home since at least 2009, when Baltimore Magazine profiled him. “We are very spiritual people, so you will see a lot of Bibles around the house and things that are indicative of that,” Carson, who identifies himself as a Seventh Day Adventist, told the magazine while pointing at the portrait. The portrait hung near a biblical quote inscribed into a wall. “By Humility And The Fear Of The Lord Are Riches, Honor and Life,” it reads.